Cordless vacuums offer many benefits over more traditional corded vacuum cleaner models. 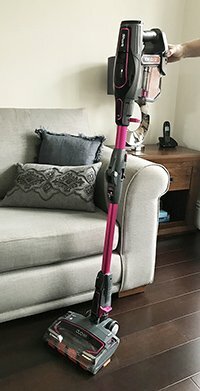 These include their light weight and manoeuvrability and their ability to be able to “pick up and go” rather than having to plug the vacuum in as you move around the house. This means they are great for cleaning up quick spills! With technology moving on, many cordless vacuums now offer similar cleaning performance to corded vacuum cleaners. You have to be careful how you spend your money though as prices, specifications and features vary considerably between manufacturers and models. We’ve researched the cordless vacuum market to find the three best models and provide an honest review on each of these. 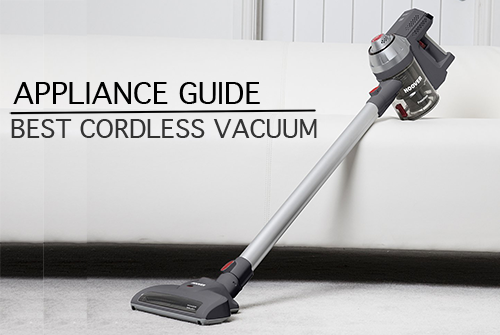 In the guide, you also find handy tips on what to look for when buying a cordless vacuum. We hope you find the perfect one! What is the best cordless vacuum for pet hairs? I have hard floors, what is the best cordless vacuum for these? Can you recommend the best cordless vacuum cleaner for carpeted stairs? I’m on a budget, what’s the best cordless vacuum for me? This is the exact model we own. This is the “pet” version of the Shark DuoClean vacuum and comes with an additional small motorised head attachment, similar to the one supplied with the Dyson V7 Animal and Total Clean models. This is also the single battery version and you can buy a double battery version or an additional battery at a later date for an extra £70. We have not done this yet but it’s a good option to have. The battery is also removable from the main unit allowing you to swap in a new battery or charge the battery in a more convenient location. One thing to point out: we mistakingly thought the single battery model came with battery docking station; it doesn’t and only includes the charging plug (which is no deal breaker). Cleaning performance is good and works very well on the higher setting. What works well for us is the fact that it can switch from carpet vacuuming to hard floors at the touch of a button on the handheld, whereas on the Dyson you would have to stop and change cleaning heads for this. Another neat trick of the Flexology models is that they can fold in half for easy storage (similar to the Morphy Richards Supervac) but also this allows you to get under low objects without having to bend down too much. Runtime and charge time are about average at this price point. We paid under £300 for the Pet model (which at the time was cheaper than the “standard” model) so this puts it at a similar price to the Dyson V7 Motorhead. However, the Dyson does not include all the attachments available with the Shark. Overall we really like this vacuum and would recommend it. LEARN MORE: Check out why we chose the Shark DuoClean over the Dyson models here and read our review after 5 months usage here. At the time of writing the Hoover Freedom was available for just under £100 which makes it a real value-for-money contender. Be careful though not to confuse this with the “Freedom Lite” model as this does not include all the hand tools or the wall mounted docking plate. 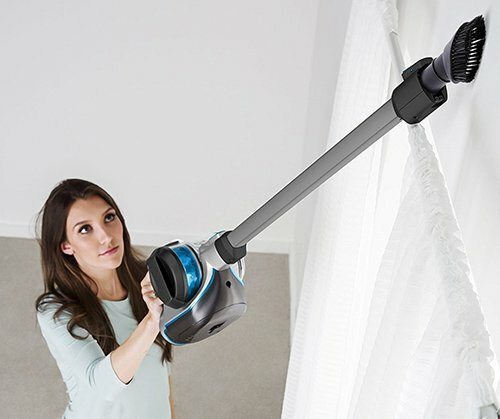 The Freedom is another cordless “stick” vacuum that converts into a handheld, like the Dyson, Shark & Vax above. The wall-mounted charger docking station includes space for 2 tools (although 4 are provided). Charge time is quite long at 6 hours to give a run time of 25 minutes (other handhelds achieve this runtime with a 3.5-4 hour charge). The Freedom comes with the essential attachments including a crevice tool, pet hair remover, small nozzle with brush and combined upholstery and soft brush tool. The Vax features a swivel head and is quite light at 2.2kg, making it easy to manoeuvre and use on stairs. The Freedom works on both hard floor and carpets but pick-up is not as good on longer pile carpets. The cleaning head of the Hoover also features a rotating brush bar for better dirt pickup. Overall then, this is a great budget buy (if you can live with the longer charging time). We have previously recommended the Dyson V6 vacuum but we feel the newer V7 model is the better bet as it offers more power and slightly longer run time. The reason we don’t feature the V8 here is purely down to its (very) high price. The V6 is currently only available in 2 models compared to 4 in the V7 range; these are the V7 Motorhead, the Animal and Total Clean. So what’s the difference between these V7 models? Its basically all down to the cleaning heads and attachments as the base unit is the same across the V7 range. The base Motorhead comes with the main motor cleaning head, a combination tool (so you can switch between hard and soft surface cleaning), a crevice tool and the docking station and charger. The Animal version is intended for pet hairs so also includes a smaller motorised handheld cleaning head. The top of the range Total Clean includes the same attachments as the Animal but with the addition of a soft cleaning brush and soft motorised cleaning head for use on hard floors. Prices vary quite a lot with Dyson’s as they tend to be on offer most of the time but expect to pay under £350 for the Total Clean and under £300 for the base Motorhead model. All V7’s have a charge time of 3.5 hours and a running time of 30 minutes, although this will be reduced if using the motorised cleaning tools. The V7 is a good upgrade from the V6 but to us, its better value than the more expensive V8. Out of the V7 range, we would go for the Total Clean as this has all the tools and attachments you would need. Some minor assembly is required after unboxing although this is quite easy. The height can be adjusted by pressing a button on the side of the handle and there is a large foot operated on/off switch. There is not as much underneath felt protection for wooden floors on this model compared to, say, the Dyson V7 or Shark. This is lightweight at 3.5 kg with the weight in the bottom of the unit so will be a lot easier than other cordless models to operate. There is a light on the front for seeing under tables and sofas, etc. plus the Air Ram has a fully swivelling head to get into most places. The Air Ram has an impressive quoted run time of 40 minutes but you do have to charge for 4 hours to achieve this. This vacuum cleaner also has easy-to-clean filters but the main downside of this model is the lack of cleaning tools (such as crevice tool and upholstery brush) that you would typically get on other cordless vacuums. G Tech claims that the Air Ram is easy to use on stairs but we’re not so sure as the cleaning head is quite large to fit on the stair treads. 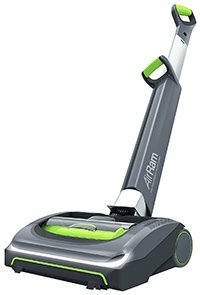 The Air Ram is a very good cleaner at a reasonable price (often just under £200) and its light weight will appeal to many; its just not as versatile a package as other cordless vacuums. LEARN MORE: Check out our G tech Air Ram vs. Dyson V8 comparison here. The big advantage of the Supervac is its price: it’s often available for just under £100 which is a big saving over the other models reviewed here. This model converts to a handheld but the handheld unit is actually in the base of the cleaner giving it a far better weight distribution (rather then the weight being on the handle end). Like the Shark reviewed below the Supervac handle also folds in half which allows it to be stored in more compact spaces. The vacuum has to be charged on the docking station (rather than removing batteries) so this is a consideration in terms of where you choose to store it. The Supervac can be used on hard floors but the head does not change, so we’d be cautious of using this particular vacuum on more delicate floor surfaces. Basic handheld cleaning tools are included but you don’t get a motorised handheld at this price. Full charge time is very long at 5 hours but runtime is decent at around 35 minutes. This is a very well priced cordless and handheld vacuum cleaner. It’ll be easier to use for some but expect to have lower suction power than the more expensive models here. Overall a very well priced and competent vacuum. The first thing that grabs your attention with the Vax Blade is the price. At the time of writing it was available on offer for around £160 on the Vax website. This also includes £50 worth of free tools. Just be careful when comparing prices as the Blade is often sold without the extra tools. The Vax is very similar in appearance to the Dyson and Shark models and features a detachable handheld unit and motorised cleaning head. As with the Shark, the cleaning head can be directly fitted to the handheld unit to make cleaning stairs easier (although the head is quite large for stair treads). The motorised cleaning head (brush bar) can be activated using a switch on the top of the vacuum. This allows it to be used on a carpet (motorised head on) and also hard floor surfaces. This is similar to the Shark which also has a hard floor and carpet setting. The brush bar is also very easy to remove on the Vax for cleaning. The battery on the Blade is 24v which is more powerful than the typical 22v ones in other machines (18v in the Morphy Richards) and this gives it a runtime of around 35 minutes (which is longer than most) but this is offset by a charge time of 4 hours. Similar to the Dyson, the Vax can also be wall mounted but the battery cannot be removed as it can in the Shark. If you can get this Vax Blade on offer for under £200 then it makes a great buy! TYPE – This will probably be your first consideration. Do you want just a cordless upright vacuum cleaner (like the G Tech Air Ram) or a model that converts into a handheld cleaner? All models here, except the G Tech Air Ram, will convert into a handheld vacuum cleaner. PRICE – Budget is another important consideration. We would ignore manufacturers recommended prices as cordless vacuums are usually always on sale. At the time of writing, prices of the models we reviewed range from £100 (for the Morphy Richards and Hoover) to around £350 for the Dyson V7 Total Clean. Quite a difference. What do you get for the extra money? In theory, this is usually a better (more powerful) motor, longer run time and more innovative features. RUNTIME & CHARGE TIME – This is an important factor for cordless vacuum cleaners. These are generally linked; the longer the run time then the longer the charge time will be. 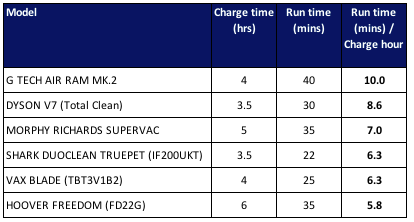 To make this easier to compare we have produced the table below which shows the charge time and run time for each cordless model reviewed and provides a “Runtime per charge hour” number to show how much runtime (minutes) you get for each hour of charging. The G Tech Air Ram comes out on top with 10 mins per charging hour. The Dyson V7 offers very good runtime compared to charging time but you will pay extra for this. You will notice that the cheaper Vax Blade and Hoover Freedom models have the lower run time per charging hour. The surprise is the Morphy Richard Supervac at 7 minutes as this model cost just under £100, however, expect dirt pick-up to be not as good as more expensive models. One word of caution though, the quoted time above will not include using motorised tools or using the vacuum on higher speed settings: these will significantly reduce the runtime. WEIGHT AND MANOEUVRABILITY– These are two very important factors as the idea of having a cordless vacuum is that its easy to use. All of the models we reviewed here have some form of swivel head that allows you to manoeuvre the vacuum around easily and get under low furniture (although the cleaning head height will determine if you can get fully under). The G Tech Air Ram and Morphy Richards Supervac have the weight lower down in the vacuum (in the G Tech it’s a floor level). This makes it much easy to push around than other models where the weight is in the handheld unit at the top of the vacuum. 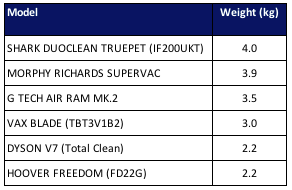 When it comes to weight, the table below shows how each vacuum compares. As you can see, there is a big difference between the Dyson V7 / Hoover Freedom models and the Shark / Morphy Richards cleaners which weigh nearly twice as much. The Hoover Freedom is also one of the cheapest cordless vacuum cleaners we reviewed! STORAGE – Another consideration we feel important is storage. Most of the cordless vacuums with the handheld unit at the top cannot stand up on their own due to the weight at the top of the handle tipping it over. There are two solutions: the vacuum cleaner either comes with a wall mounted charging holder or, in the case of the Shark Duoclean, the handle can be folded over. This makes the Shark easier to store in more compact spaces and this folding feature is also included on the Morphy Richards Supervac. The G Tech Air Ram has no problem with storage as its more of a traditional upright vacuum cleaner design. GUARANTEE – The vacuums we reviewed either come with a 1 or 2 year guarantee. Check the battery though as these often only come with a one year guarantee, even on models with a vacuum cleaner 2 year guarantee. ACCESSORIES – Don’t always assume that you will get the handheld accessory attachments with the vacuum cleaner. In the past, this was a given but now manufactures see this as a way of charging a premium for models with accessories. A small motorised cleaning head (for use on the handheld) is a useful feature for cleaning stairs or upholstery, especially if you have pets or people in the house with long hair. Our Shark Duoclen Pet has this tool as does the Dyson V7 Animal. DIRT COLLECTION & EMPTYING – All of the vacuum cleaners featured here collect the dirt in a container. The G Tech is slightly different as it collects dirt in “bales” within the cleaner head. 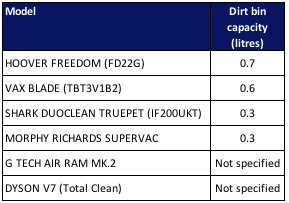 Each vacuum cleaner will have a different dirt container capacity and these are shown in the table below. The container capacities range from 0.3 litres (about the size of a soft drink can) on the Shark and Morphy Richards models to o.7 litres on the Hoover Freedom. Regardless of the size, they all still hold a reasonable amount of dirt before you need to empty. Emptying the dirt container is another area where manufacturers try to distinguish themselves with innovative features. Most offer a way to empty the container by operating a button that opens a flap on the container. The Dyson V7 features a more complex system but, after seeing it in use, we’re not convinced its any better than the other models. POWER BUTTON – This is also another design feature to look at. Some cordless models (the Dyson V7 is one) require you to keep your finger on the power button when in use. This is designed to prevent the battery only being used when needed but can cause problems for people with arthritis or other musculoskeletal conditions. Other manufacturers, such as Vax and Shark, require that you press the power button once and it’s then left on during cleaning. The Hoover Freedom offers a hybrid solution where it can be left in “continuous” mode by operating a switch. CHARGING METHOD – This will really come down to a matter of preference. The most basic charging method is to simply plug a charger into the handheld unit. Other models have an integrating docking & charging station (which can often be wall mounted). The Shark DuoClean is the only cordless we reviewed with a removable battery. This can be charged in a separate docking station but this is an optional extra. DIFFERENT FLOOR SURFACES – All manufacturers of the models reviewed claim that their cordless cleaners can be used on carpet and hard floor surfaces. What we’re interested in here is how the vacuum does this and if it offers any extra protection and cleaning performance for hardwood floors. 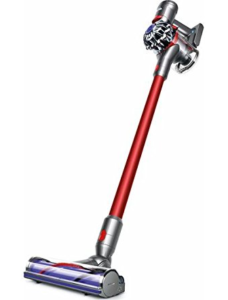 The Dyson V7 (Total Clean) has two separate heads, one for carpets and one designed specifically for hard floors. The Shark DuoClean has two rollers and can change settings between carpet and hard floors. Similarly, the Vax Blade’s motorised brush bar can be switched on for carpets and off for hard floors. Other models, such as the Morphy Richards Supervac, simply move between the different surfaces. It all depends on your floor surfaces. If you have carpeted floors then look for a cleaner with a motorised cleaning head. If you have hard floors then a softer head may also be required especially if you have more delicate floor surfaces. If you have both, then look for a cordless vacuum cleaner that allows you to switch between the two floors surfaces quickly (such as the Vax or Shark). If you have a cat or dog then you’ll need a specific type of cordless vacuum cleaner to deal with pet hairs, as they tend to cling to carpet fibres. The best solution is to find a vacuum cleaner that includes a motorised cleaning head and motorised cleaning tool. Out of the models we reviewed above that means you are looking at the Dyson V7 Animal or V7 Total Clean or the cheaper Shark DuoClean TruePet. For hard floors (assuming you also have carpets) you’ll be looking at a cordless vacuum that can switch between different floor types. All cordless models reviewed above can be used on both carpet and hard floors but some will deal with this better than others. For instance, the Dyson V7 Total Clean has a separate hard floor cleaning head and the Shark DuoClean has a dual hard floor and carpet cleaning head. 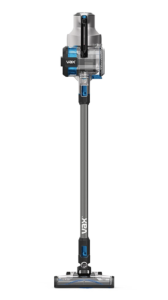 The Vax Blade’s motorised brush bar head can be turned on/off making it ideal for switching between different floor types. Carpet on stairs tends to get quite dirty and is also a bit more tricky to access than a typical room floor. Therefore, we suggest you choose a vacuum cleaner that can be converted to a handheld and has a decent brush attachment (motorised if possible). You are probably then looking at a “pet” version of a cordless vacuum cleaner although standard brush attachments would work fine. The Hoover Freedom and Shark DuoClean’s main cleaning head can be attached to the handheld unit to make stair cleaning even easier. Without a doubt, we would recommend the Hoover Freedom! Throughout this article, the Hoover Freedom has appeared many times due to its technical specification and features list. If you can get this model for around £100 then we would say that it’s a great value-for-money purchase.